OneDriveAttachmentsEnabled: Allow or block attaching files directly from OneDrive for Business. Default value is True. ClassicAttachmentsEnabled: Allow or block attaching files from the local device. Default value is True. ReferenceAttachmentsEnabled: Allow or block the use of “cloudy attachments” or the “send as link to file” functionality. Default value is True. ThirdPartyAttachmentsEnabled: This parameter is now deprecated, see below. ThirdPartyFileProvidersEnabled: Allow or block attachments from third-party services, such as Box, DropBox and so on. Default value is False. 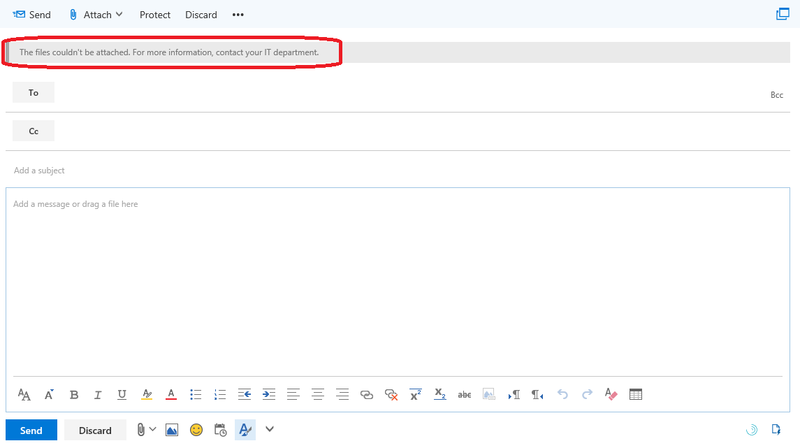 SaveAttachmentsToCloudEnabled: Allow or block saving an attachment directly to OneDrive for Business. Default value is True. The end user experience with any of these configured is very similar to what’s shown on the screenshot above. The Attach button will remain active, and so will all its submenus and any related dialogs. Only after you finish the process, you will be informed that the file cannot be attached. In other words, there’s definitely a lot of room for improvement, but even in it’s current state, the feature will make some companies happy. For additional information about the different types of restrictions you can configure, refer to the Set-OwaMailboxPolicy cmdlet help. One last thing – the new OWA UI does NOT currently support these restrictions.